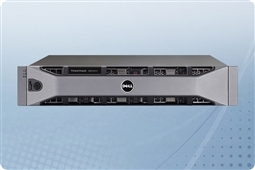 The 2U Dell PowerVault MD3600f 8Gb fibre channel storage array offers high availability, high performance and business continuity without sacrificing ease of use and reliability. As part of the PowerVault MD3 fibre channel array series, the MD3600f is perfect for businesses that require peak performance and data security while consolidating their storage. Aventis Systems carries the MD3600f with up to twelve 3.5” SAS or nearline SAS hard drives. Our MD3600f’s include a single quad-port 8Gb fiber channel controller with 2GB flash memory battery-backed cache. An optional upgrade to dual redundant fiber channel controllers is available for a total of 4GB cache and support for an active-active mirrored environment. Each controller includes a 6Gb/s SAS Out port for expansion up to 192 drives with the MD1200 and MD1220 enclosures. Controller features include dynamic disk pools (DDP) to eliminate the need for complex RAID management while optimizing data protection. Other standard features included with the MD3600f include vCenter Plug-in, VMware vStorage APIs for Array Integration support, vStorage API for Storage Awareness, active-active LUN access, Sight Recover Manager, self encrypting drives and thin provisioning. Please browse our selection of PowerVault MD3600f 8Gb FC SAN models below. Curious if the Dell PowerVault MD3600f SAN (Storage Area Network) Fiber Channel array is right for your business continuity and budget? Check out our Survival Guide: Avoiding A Data Apocalypse today! 24TB (12 x 2TB) 7.2K 6Gb/s NL SAS 3.5"
36TB (12 x 3TB) 7.2K 6Gb/s NL SAS 3.5"
If you are looking for the same robust features and 8Gb fiber channel technology with 2.5” hard drive options, please check out our MD3620f’s with up to twenty-four 2.5” hard drives. Can’t find what you’re looking for? Have a question? We are happy to help! Please use our Live Chat Live Chat or call us at 1.855.AVENTIS (283.6847) during regular business hours, or email us at Sales@AventisSystems.com for a custom quote.